It has happened an hour and a half earlier than Nintendo said, but the Switch eShop maintenance has finished. 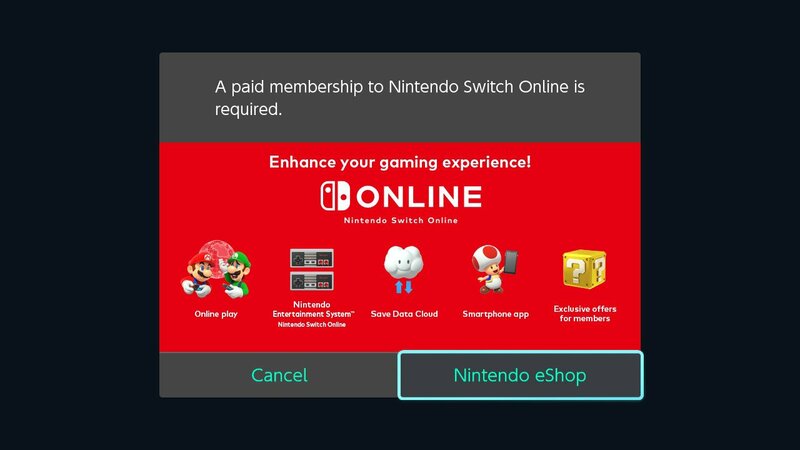 The Switch Online service has now gone live, and you can now purchase a Nintendo Switch Online subscription. If you try to play some online multiplayer on a game that requires a subscription, you will now get a message about the matter. A picture of the message can be seen down below. Moment of truth huh boys n gals ? Well the NES game section is great. Now start rolling out tons of games regularly and build in some sort features, figure out how to get third party licenses on board and this thing could become a system seller instead of bad press. Cool. good thing it doesn’t work on free games. So is Luigi’s Balloon World effected by this change? Luigi’s Balloon World is still free. We’re good.